Megalux came fourth overall, having come third in the lap count. 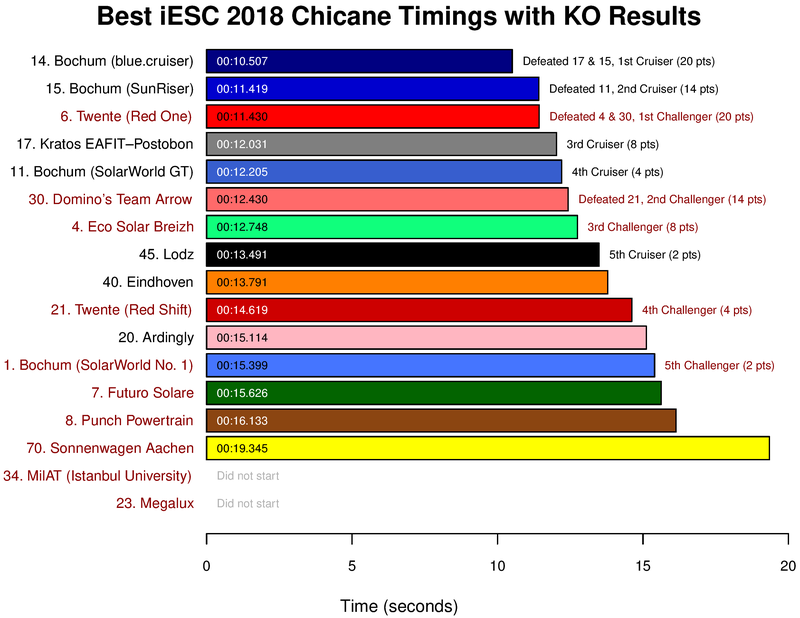 Kratos EAFIT–Postobon came fourth overall, in their lovely solar sports vehicle, having run the fastest lap, won the regularity sub-challenge, and come third in the KO chicane. See here for more information on the teams. Well done to everybody for coping so well with the terrible weather! Update: And don’t forget to watch the great series of videos from Bochum. 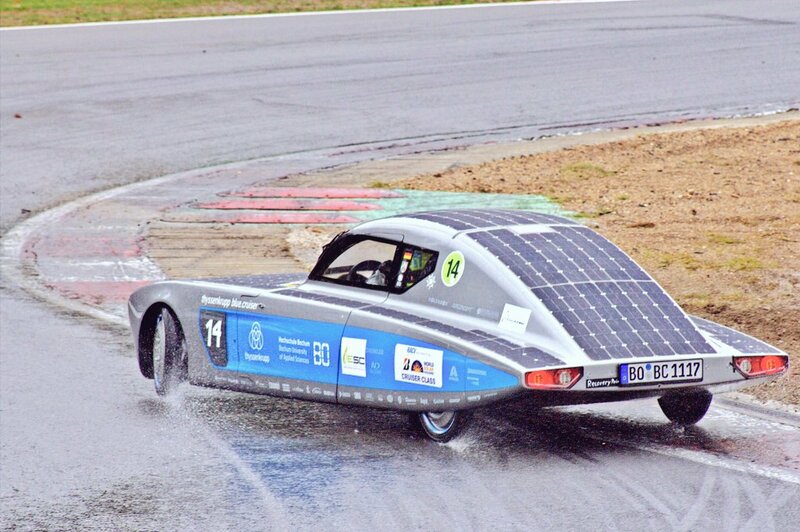 The iLumen European Solar Challenge (iESC) in Belgium has held the KO Chicane component of the event, under extremely wet conditions (see this!). This component of iESC counts for 20% of final points. On mean times, Cruisers were 2.1 seconds faster in the Chicane than Challengers. The revised chart below (click to zoom) reflects the scoring (which, it must be said, has Bochum bringing home the bacon so far). Times shown are the best out of qualifying, semi-final, and final times. See also this excellent video. Tomorrow is the big race. For fans at home interested in the weather, here is a webcam nearby, looking towards the Zolder racetrack. 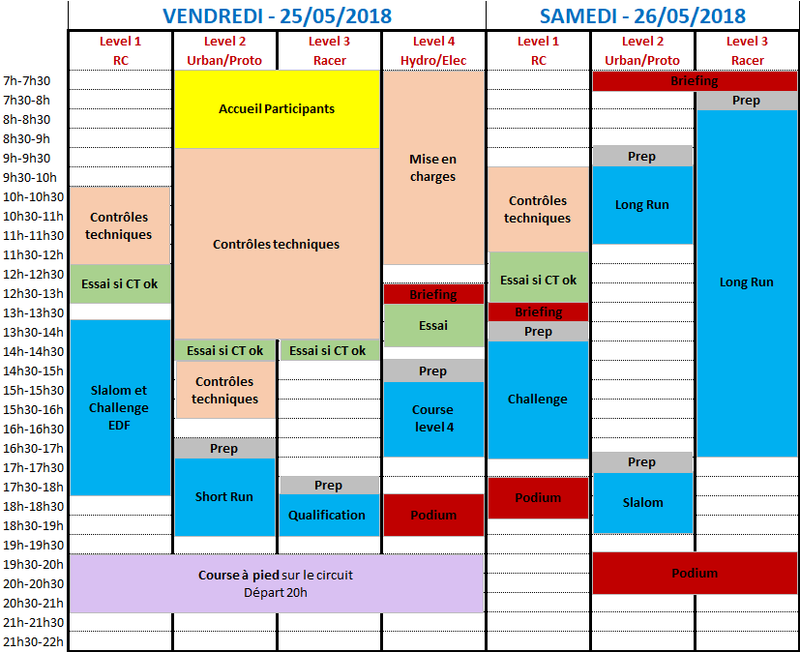 See also my iESC teams list and information page and the live timing board. Breaking that down, v is the speed of the car, ρ is the density of air (about 1.2), A is the frontal area of the car, and Cd is the drag coefficient, a number which indicates how aerodynamic (and therefore, how energy-efficient) the shape of the car is. 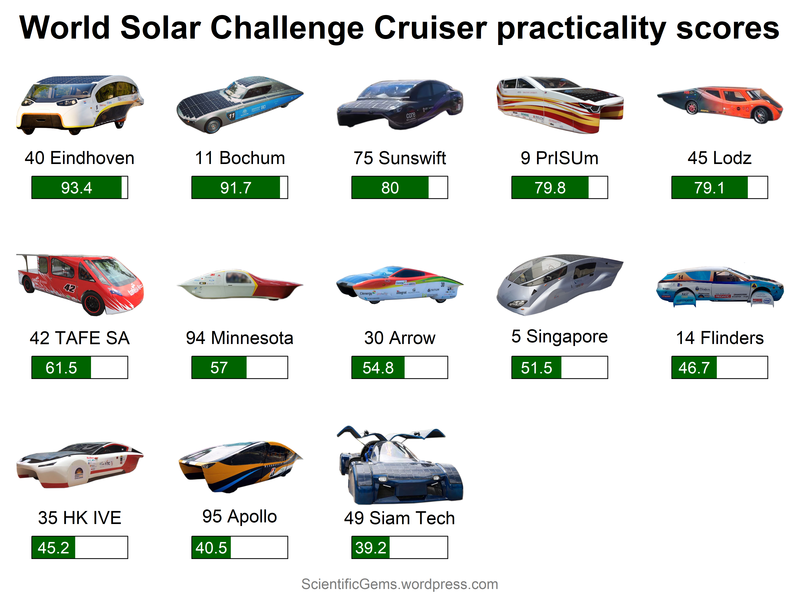 For Challengers, minimising Cd allows the speed v to be increased, while for Cruisers (for which the average v is essentially given), minimising Cd allows non-solar energy use to be minimised. 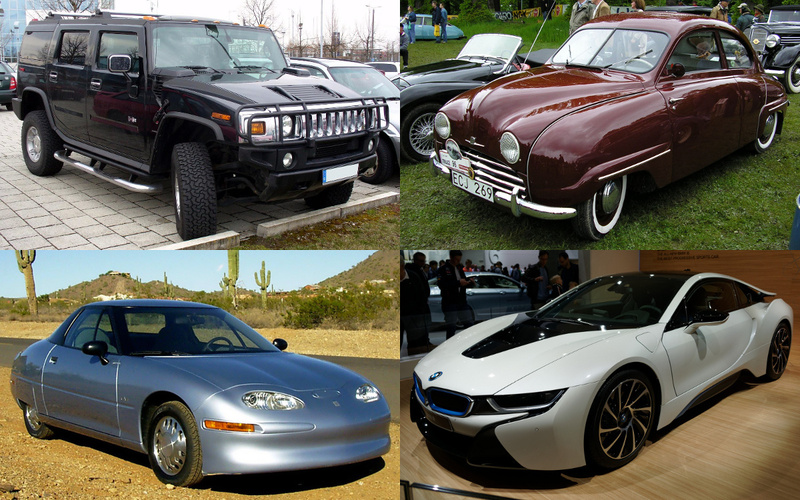 Of course, minimising frontal area is important too (and that is the motivation behind asymmetric Challenger cars). I understand that Sunswift’s 2013–2015 car eVe had Cd = 0.16. 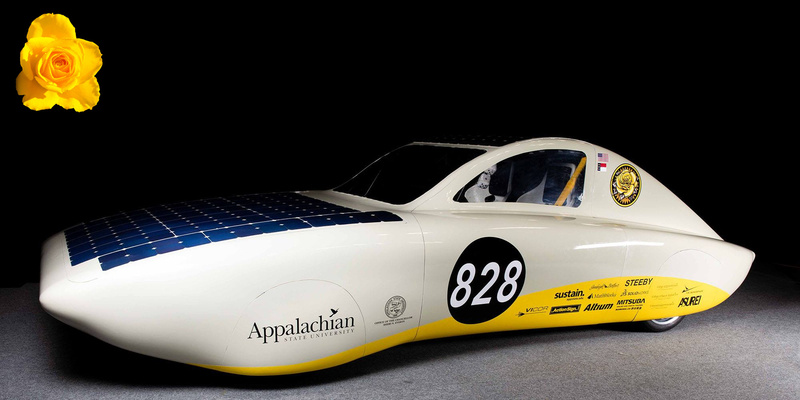 Appalachian State (Sunergy) have stated that their newly-built ROSE has Cd = 0.17. PrISUm’s Penumbra has a higher value (Cd = 0.2), because of the blunt end which they chose for practicality reasons (although they did do a few clever things to reduce the impact of that blunt end). I’m not aware of the Cd values for other ASC cars. 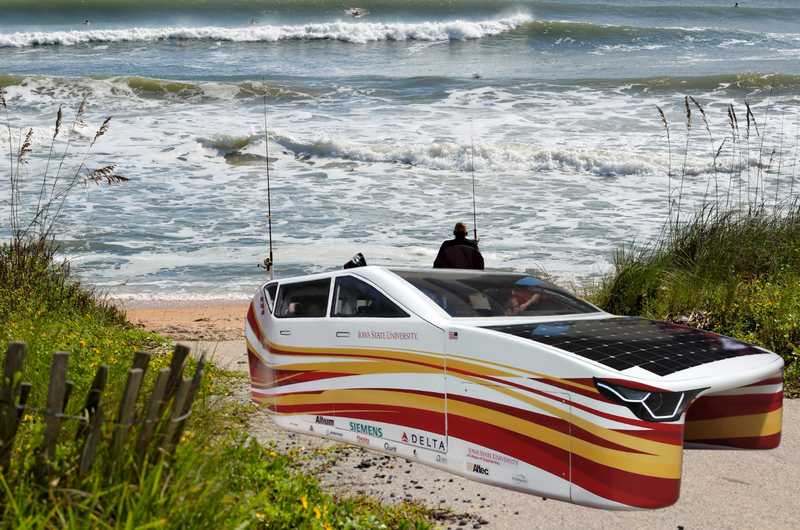 The American Solar Challenge Cruiser class is a contest for multi-person solar vehicles, each powered by 5 square metres of silicon solar cells (or 3.3 m2 of multi-junction cells), with the option of recharging from the grid. 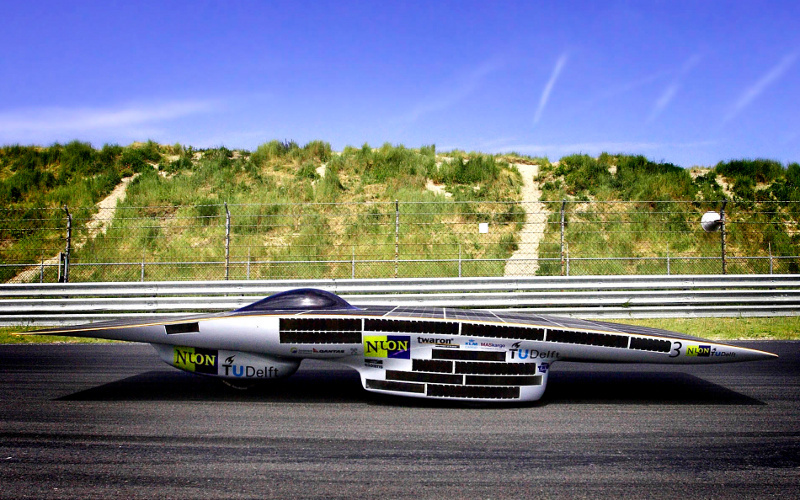 The contest is not actually a race – cars must get to the finish line on time, carrying as many people as possible, and drawing as little power from the grid as possible. Cars are also scored partly on practicality. This can mean different things. 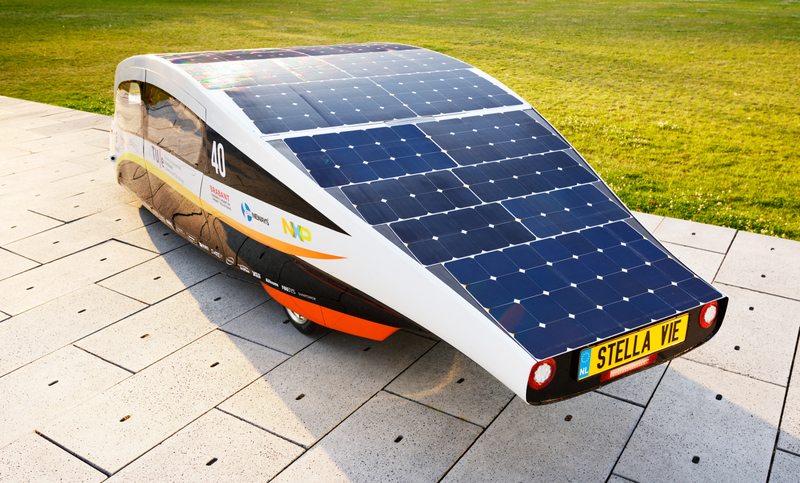 Eindhoven’s 2015 car (Stella Lux), for example, was designed as a four-person family car, and the team took photos of it doing family things like shopping, going on holiday, and picking children up from school. 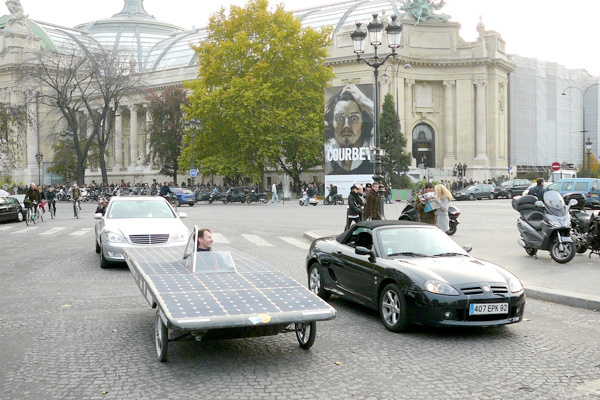 A big feature was that, for an average family in the Netherlands, the car would produce more electricity than it used. 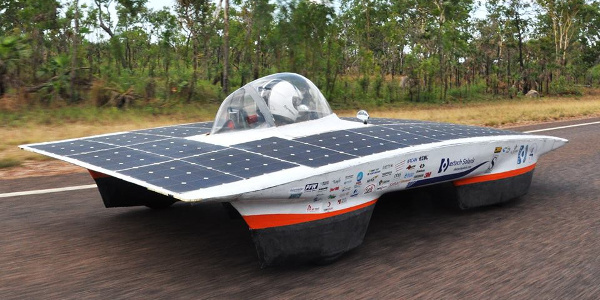 The car scored 84.5 for practicality at the 2015 World Solar Challenge. Bochum’s 2015 car (ThyssenKrupp SunRiser), on the other hand, was a luxury two-person sports car, with leather seats and an incredibly beautiful interior. It was an almost perfect example of the car it was trying to be, and scored 80.5 for practicality (far higher than the next car, which scored 63.5). One of the highest WSC 2017 Cruiser practicality scores went to PrISUm for their four-seat Penumbra, which was intended as the kind of practical SUV that you might take on a fishing trip. The car has plenty of room for carrying your esky, tackle box, etc. PrISUm deliberately made some aerodynamic compromises in order to achieve their practicality goal, and the car scored 79.8 for practicality at WSC 2017. This year at ASC, PrISUm’s Penumbra is again a strong contender. 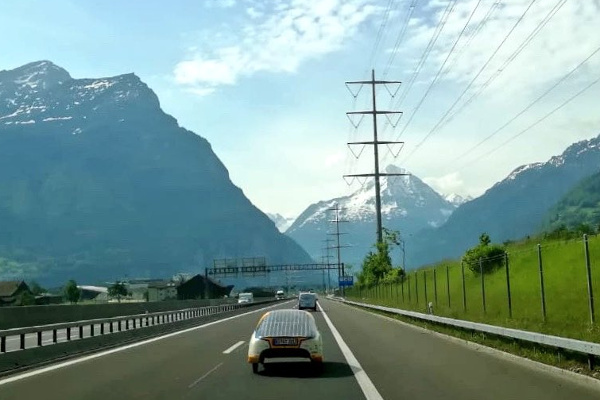 Minnesota (UMNSVP), Appalachian State (Sunergy), and Waterloo (Midnight Sun) are entering two-person solar sports cars, while Onda Solare from Italy seems to be inspired by Eindhoven (see my annotated teams list). It promises to be an interesting field. 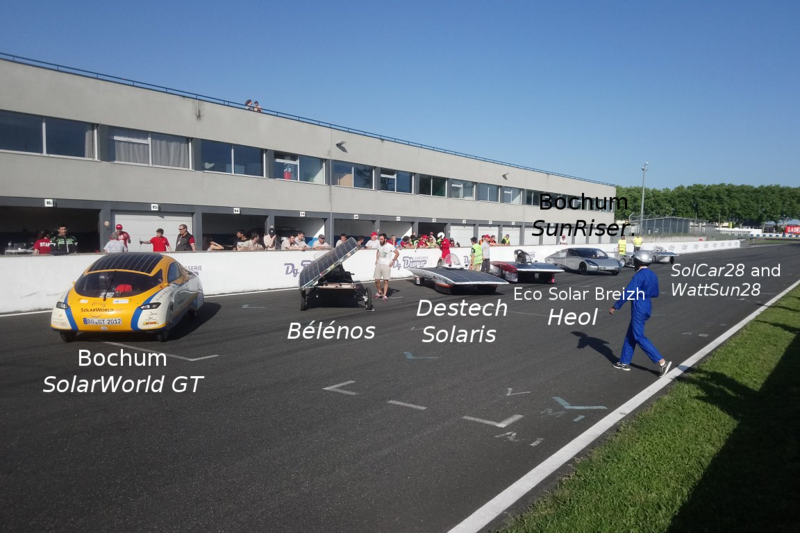 The Albi Eco Race at Circuit d’Albi in France this weekend had five solar car teams in addition to their other race classes (see also the race start). The weather was fine. 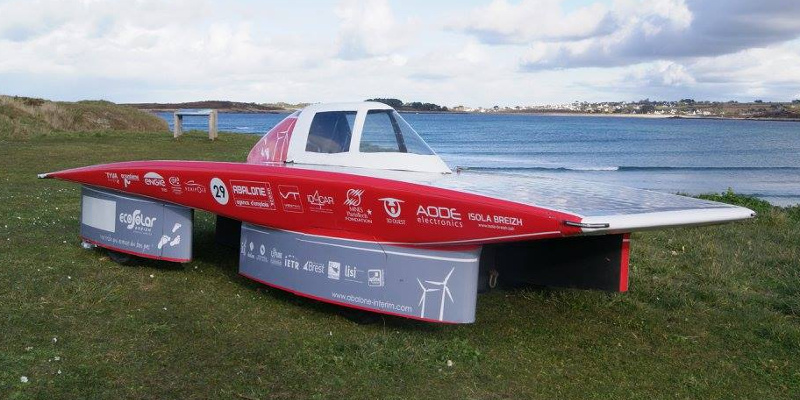 You can check out the copious FB photographs from Eco Solar Breizh or the official social media ( and ). Final results are shown below. This team came 14th at Abu Dhabi 2015. It is a French (or rather, Breton) team, started in 2008. They also raced at ESC in 2014, and came third in the 2017 Albi Eco Race. 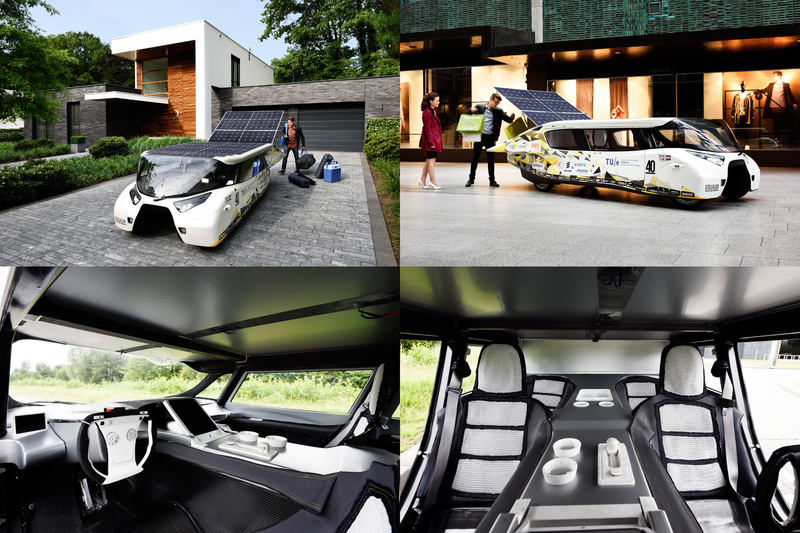 Their car is called Heol, and is a symmetric design. They recently got new solar panels. Final result: 5th. This team is from Polytech Clermont-Ferrand. They raced at WSC 2009. Final result: 3rd. 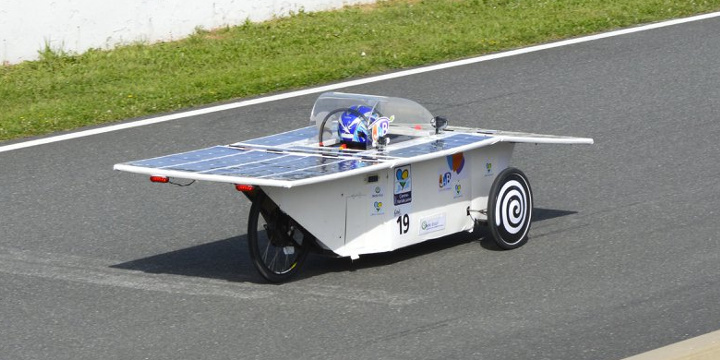 This team, from Lycée Jehan de Beauce in Chartres, fielded two cars: SolCar28 (illustrated) and WattSun28. 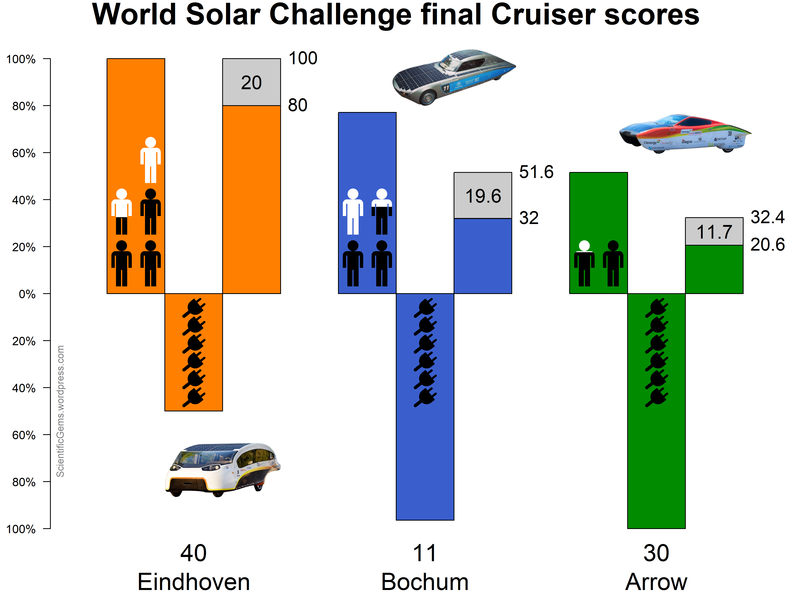 Final result: 4th (WattSun28) and 6th (SolCar28). This team came 2nd in the WSC 2013 Cruiser class. They came 3rd in the WSC 2015 Cruiser class. They came 2nd in the WSC 2017 Cruiser class. They came second in the 2017 Albi Eco Race. 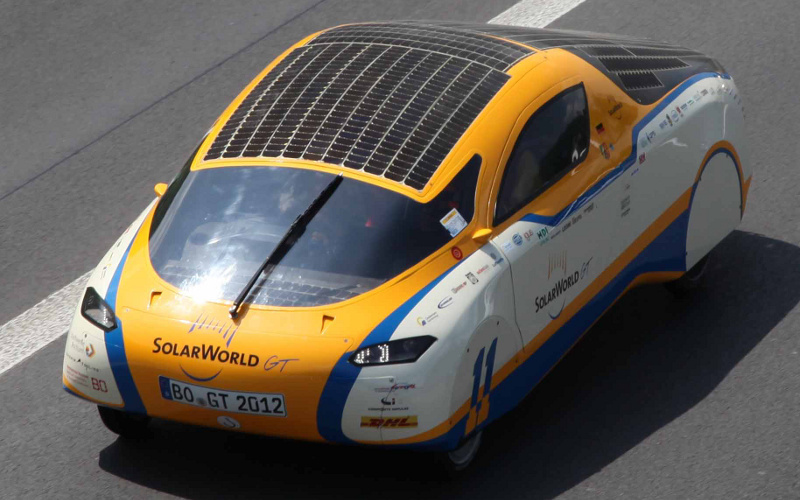 They drove to Circuit d’Albi with their 2011 car, SolarWorld GT. They also took their incredibly beautiful 2015 car, the ThyssenKrupp SunRiser. Both are 2-seat Cruisers. Final result: 1st (SolarWorld GT, 103 laps or 367 km) and 7th (SunRiser, 100 laps but late-race battery problems). This team came 25th at WSC 2015. They came 9th at ESC 2016. 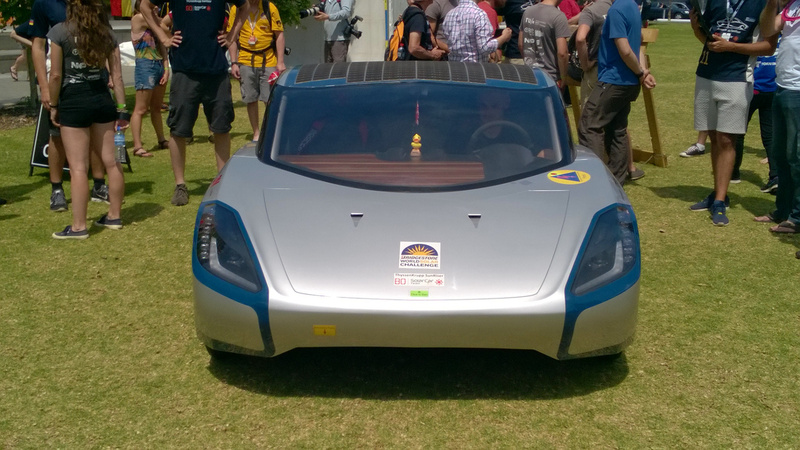 Their car is called Destech Solaris, and is a symmetric design. They arrived at Albi very early Friday morning, after a long trip. Final result: 2nd. 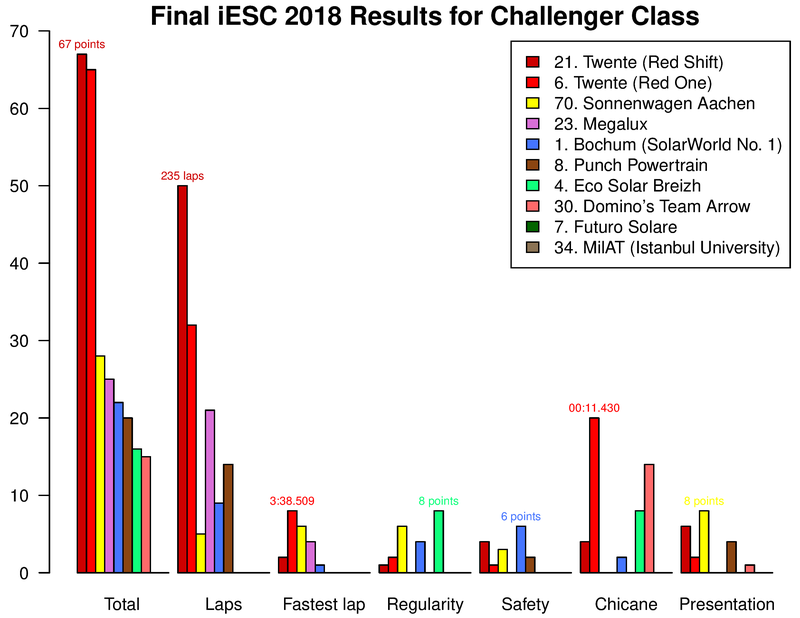 The chart above shows 2017 team composition for the Eindhoven and Bochum solar car teams (divided by study major, not team responsibility). Not surprisingly, electrical and mechanical engineering students are the core of both teams (about half in each case) Yet there is also considerable diversity, because the business side of a solar car team requires other skills too. The Bochum team also includes a media unit, which explains the large “other” category (one of the team photographers is a biology student, for example). The chart was constructed by parsing web pages, which may have introduced errors (also, I guessed a bit with the German words). 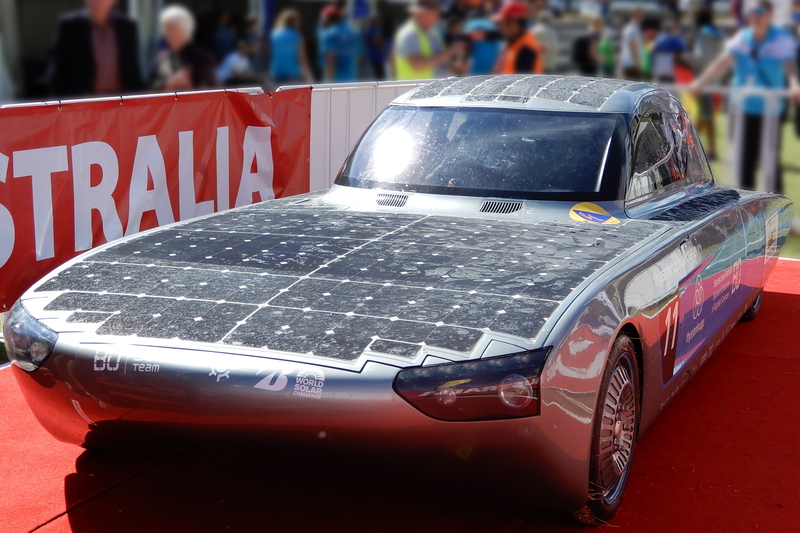 But the main point stands – solar car teams require a diverse set of skills. 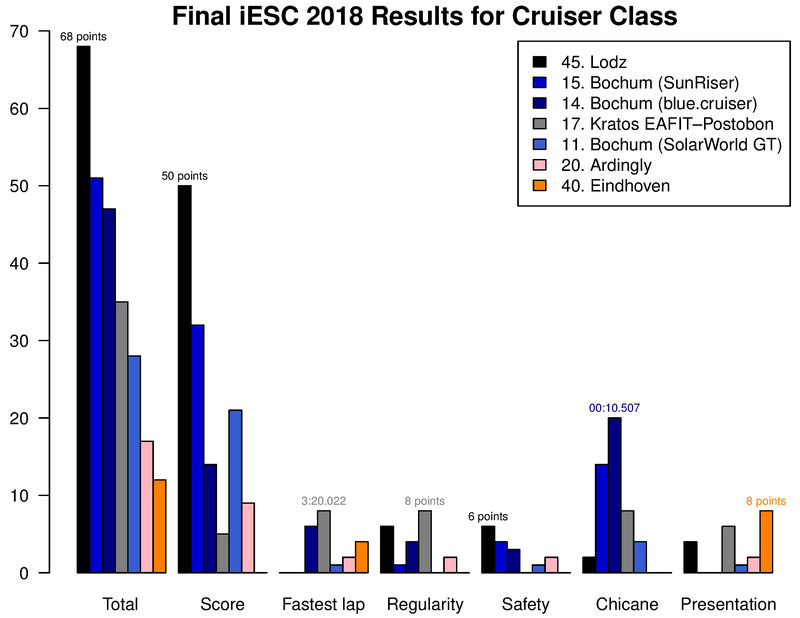 Based on the official results, the chart below (click to zoom) shows the final scores for the WSC Cruiser class. Each team has three coloured bars: first the number of person-kilometres, which should be large (black icons show occupied seats and white icons empty seats), then the energy usage, which should be small (number of charges, which is 6 in each case, times battery capacity), and finally the overall efficiency score, which should be large again (it is the ratio of those first two numbers). The rule for the efficiency score bar is: first bar divided by second bar, then scale so that the largest result is 80%. The scaled practicality scores out of 20 (grey bars) are then added. Eindhoven is the clear winner, with Bochum second. The chart below (click to zoom) shows the raw practicality scores for all Cruisers (finishing, non-finishing, and non-starting).